As educators, we all agree that we want students to be creators - placing them in open-ended contexts where they have to apply their knowledge (and content) to solve problems. having student help determine quality by establishing rubrics prior to beginning. An authentic PBL problem/project is shared. Students learn and apply content as they create solutions, sharing their product. Teachers provide time for students to self-assess or peer-assess. Learning, and potential for future improvement, is facilitated. 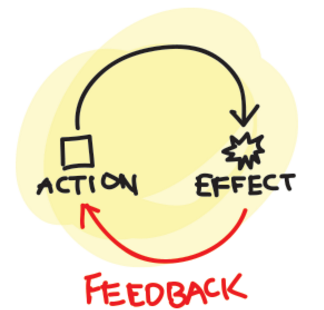 The more dynamic we can make this feedback cycle, the greater potential for learning. Basketball players can watch film of previous games (to self or peer evaluate). Certainly, while playing the game, players also learns skills which can be practiced for future development. In this sense, basketball players mimic a strong classroom experience. However, basketball players (or jazz musicians or a Socratic discussion participants) have to do more. Certainly they must take action (problem-solve); but they also must evaluate and adjust along the way. When one player gets hot and is making every shot, the other 9 players on the court all adjust. These are the experiences where creativity and evaluation are happening simultaneously. There is an interdependence between participants that is typically missing from most classroom experiences. The thinking and actions of one participant can quickly affect others. 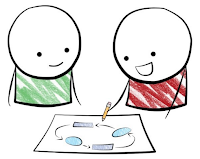 The act of evaluating is not an after-the-fact (wonderful) add-on to aide learning; it is a necessity to successfully navigating a dynamic experience! Can we shorten (or even integrate!) 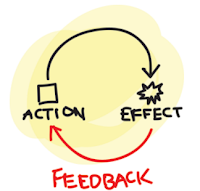 the action and feedback cycle in our classrooms within authentic, open-ended problems? The more we can, the more we mirror the type of learning that.students will need in their future and has proven effective in many real life learning experiences. 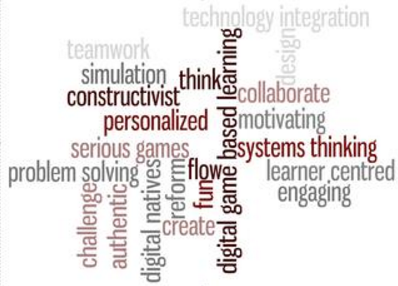 Here is where the power of Games-Based Learning (GBL) has huge potential. Consider the recent success of Minecraft and other multi-player simulations. Students are certainly creating their own solutions within these environments. 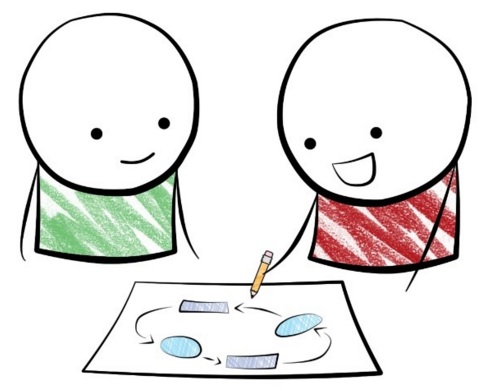 It’s easy to see how students learn from this interaction - picking up ideas and techniques from others. But students are also interacting and evaluating within an environment that is changed by their action. The real beauty of these environments? Just like our basketball game, they are dynamic based upon the actions of the participants. This better represents the real world problem-solving (and real-world learning along the way) - where there are seldom “right” and “wrong” answers. Instead, participants must navigate messy environments that more closely resemble gray rather than black and white. Our best GBL learning environments allow many opportunities where each of these 3 stages can be reasonably debated by intelligent participants. 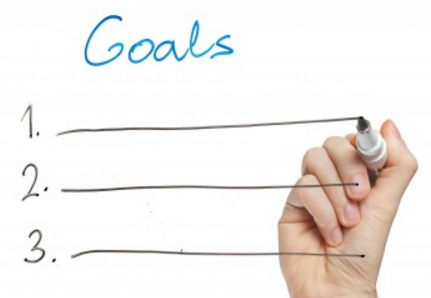 Content and skills are needed, but they are not the goal. They are means to an end - successful application in a specific context as judged by peers. This is the power of GBL. Multiple choice and essay assessments can’t compete. If we want GBL to take root in more classrooms we need to leverage their unique potential to provide this interactive model. We are two educators at the core. We founded our company with the belief that learning in schools must to be naturally engaging and mirror the skills of the real-world to promote intrinsic student motivation. That belief has guided us in creating a learning experience with five unique features needed to prepare our students for tomorrow. As news is shared, the environment changes. And, like Minecraft, as students take actions (adjusting their company’s business plan or buying/selling shares), the simulation itself (company’s strategies and share prices) dynamically changes. Because the environment is dynamic and inter-dependent, we have students who are simultaneously creating/adjusting solutions while also evaluating (and learning from) others' solutions. The challenge we need to overcome? Building (and using) this sort of open-ended GBL environments is different. We see two main challenges we have to overcome. Typical games are plug-n-play experiences with scripted storylines. Open-ended GBL experiences require changes in expectations and focus on different skill-sets. If users expect a plug-n-play, they will be disappointed - just as they would with Minecraft. Teachers can - and should be - shapers of learning. SimCEO (like Minecraft) require teacher customization to better target traditional curricular outcomes. Students need to learn to be creators and simultaneous evaluators of quality. They are not just seeking the fastest way through a quest. They are not short-cut seekers, looking to outsmart the programming to win by gaming-the-game. Open-ended learning environments are likely aimed at different goals than traditional, linear GBL environments. This can sometimes confuse. In traditional GBL environments, the user’s growth is visible and directly related the product - usually the ‘level’ of attainment. But in open-ended GBL environments, the goal of the game may not be the main learning goal. Creating and running a successful business (or building a cool Minecraft environment) is informative, but doesn’t fully represent the student’s learning. There's no guarantee that the 'winner' of such a game actually learned more or even established the best business. Small formative assessments can be built in to assess traditional content - similar to linear gbl environments. But to really tap into the power of open-ended, dynamic environments, we need to ask deeper questions to students?. Why did you _____ ? Why did you choose the action of X when presented with Y? What action within this environment represents your best decision? Why? What skills or content do you need to better understand in order to improve? It will take creative solutions to leverage the real power of these open-ended GBL environments. It’s a journey - one that our students need us to take. That’s why we seek partners who share our passion. Innovative teachers: We invite you to customize an environment in our simulation for your students. Advocates of innovative GBL: We are actively seeking partners with experience in investment, business development, or B2B partnerships who can take this model of learning to the next level for a new generation of students.